Mt. 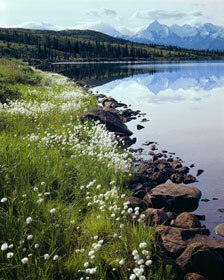 Brooks, Cotton Grass, Shore Of Wonder Lake, Alaska Range, Denali National Park, Alaska, copyright 1971 by Philip Hyde. Tuesday, July 6, 1971: We showered and cleaned up our gear after breakfast. The Slickrock text proofs arrived in the mail when we picked it up at the Juneau post office. Philip packaged film for mailing. Later he unloaded and reloaded film in the afternoon while David and I explored the Alaska State Museum again. Docent Bonnie Koenig, an Eskimo and Athabaskan Native American explained the displays. We also saw the flower slide shows. Then we walked up town to buy the Heller Alaska flower book. We stopped in at Skip Wallen’s Kayak Gallery to admire his lithographs. Painter Rie Munoz was also there. He’s an artist who works for the museum as well as making bright yarn belts and water color paintings of Eskimo scenes. Next we rejoined Philip in the camper where he had finished his film loading chore. We walked over to the dock area for dinner. Afterward Philip emptied the septic tank. We drove out to Glacier Village and the laundromat for a big wash while Philip put David to bed. We finished other errands and correspondence. Then we drove out to the same Mendenhall Glacier campground for the night. Another gorgeous shot of your father’s, David. The composition is excellent! You had a wonderful childhood, getting to travel and spend so much time with your folks. Your mother seems to have made it an educational experience, also. I had to laugh at your comment on your grandmother’s death. Kids are so practical. Hi Sharon, I appreciate your comment. It’s true, kids are so practical, and literal. I guess I was no exception. Regarding my upbringing, I was indeed very fortunate. As children you don’t think of the current everyday experience as anything special. It’s only when you are older do you realize the true meaning of these experiences. You were indeed fortunate to have the life experiences that you did as a youngster. Do you still have any of your early photographs? I think that mine disappeared long ago. I would love to go back through them. Thank you, Greg. Yes, I have files and files of my early childhood photographs. My father doted on me as a small boy, especially through his Hasselblad medium format camera. He loved to make portraits of my mother and me. There are loads of them and many of them are excellent photographs. He was most definitely a superb people photographer even though that was not what he emphasized. He loved his family and it showed through his preferred medium of artistic expression. Your mother sure had a beautiful way to share your daily activities. I especially appreciate her details in all the foliage and flowers. She definitely had an appreciation of beauty. I’m glad to get to know her better through her writing. Hi Nancy, thank you on behalf of my mother for your compliments of her. She was a beautiful companion and helpmate to my father, as well as the greatest mom ever, particularly in my earlier childhood. I have many, many fond memories. We butted heads later as I moved closer to the teenage years. But I couldn’t have asked for a better mother as a role model of class, etiquette, charm, manners, independence within teamwork, positive attitude, integrity, interest in culture, connection to nature, humor, self-sacrifice, tireless work of many kinds and loyalty to my father in every way and on all levels. Nice to read the journal of places I have been. Your mother describes the beauty of the road system in Juneau nicely. It is still one of my favorite places in the state. Hi Mike, thank you for your comment. I looked around on your website a bit just now too. It is interesting to view Alaska through the eyes and photography art of a native. I like the diversity and quality of your images of the state. I believe you have attained your goal. Your landscape photographs of Alaska do fine justice to the Great Land.